A new year begins, so for the ninth year in a row, I'm taking a moment to record, reflect, assess, and aim. Last year, I described 2010 as a landmark year, and it was. Analog, Mild Bunch, Brooklyn Beta, Mapalong, and PHP Advent. Even without factoring in conferences and such, it was a big year. All of 2010's accomplishments seem trivial when compared to 2011, because in May, Tegan was born. 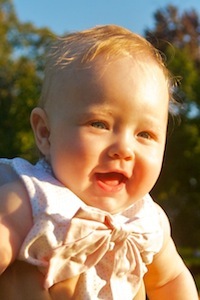 She's eight months old as I write this, and being a father still feels new. Life has changed, and I have a renewed excitement for what lies ahead. I love what I do, and I love where I do it, but I can't wait to get home each night. If you want to keep up with Tegan, you can follow her on Twitter. Her Twitter account has been a fun way to record life as it happens from her perspective. Mapalong is an app for bookmarking places. In a nutshell, we've made Google Maps social and beautiful. I haven't blogged much about Mapalong, but 2011 was full of ups and downs that I wish I had recorded. Although I've been involved with many startups and have even been involved early enough to be emotionally and financially invested, there's nothing quite like the struggle of bringing your own idea to life. If we find the right investor, we're going to be growing the team and opening the doors this year, and that's exciting. If you'd like to try Mapalong in the meantime, reserve your username with Twitter, then let me know. With the help of our colleagues and friends (especially Jessi), Cameron and I organized a second Brooklyn Beta this past October. It was an experience that's hard for me to put into words. I will try to summarize Brooklyn Beta in a separate post soon. For now, I'd just like to say thanks to every speaker and every attendee who helped make it something truly special. In March, I pledged to blog more and convinced a lot of other people to do the same. It worked for a while. Planet Chris was full of wonderful content, and my link blog was busier than ever. Over time, my commitment waned, but I had a pretty good excuse. No excuses this year; I will get my blogging rhythm back. I went to New Adventures in January, but I went as an attendee, not a speaker. In fact, I did not speak at any conferences in 2011. (I spoke briefly at Brooklyn Beta, but that doesn't really count.) Just a few years ago, a recurring resolution was to speak at fewer conferences, because I felt like I was never home. How things have changed! 2011 was a really nice break, and it gave me a chance to focus on my family and my work. Sean and I curated another PHP Advent. This year was more of a struggle than usual, but I'm very happy with how it turned out. I believe strongly in Mapalong's promise, and 2012 is an important year. We need money to give us the freedom to focus on it and make it a success. We're also working on an iOS app with full mobile support to follow. Once you can take Mapalong with you wherever you go, we'll be a release or two away from opening the doors. I can't wait. This is the year Brooklyn Beta becomes more than a conference. We've got some exciting things planned, and if you want to stay informed, please follow @brooklynbeta or subscribe to our newsletter. In 2012, I'm going to speak at a few select events. In February, I'm giving a talk at Boston PHP, my first talk in a year and a half. It's an updated version of my keynote at DPC, where I'll be talking about human behavior and how it impacts everything, even security and other things that developers care about. In March, you'll find me at Greenville Grok. I'm not sure what the rest of the year holds, but I hope to at least make it to Build. I want to get back into the rhythm of writing. This not only means blogging more, but it also means writing for other publications from time to time, exposing myself to more diverse audiences and therefore more diverse ideas. In 2012, I want to get back to growing professionally, which means acquiring skills. Learning and writing go hand in hand for me, so these two goals fit together nicely. 2011 was a very challenging year. In some ways, a challenge can be its own reward, but here's hoping everyone's hard work in 2011 pays off in 2012. I'm pretty darn excited to see what's around the next corner.